Monumental Olive Tree of Vouves in Kolymvari. 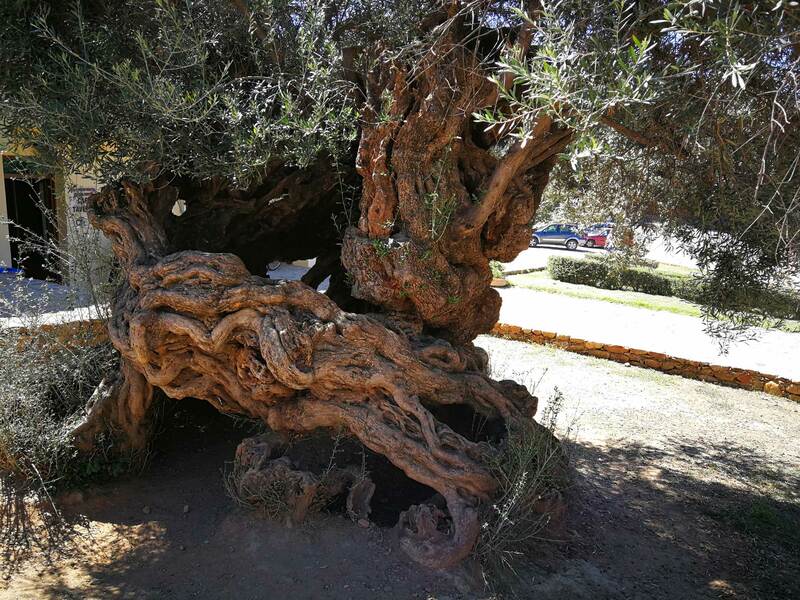 They say this is the oldest olive tree in the world, but the olive trees of Bechealeh in Lebanon challenge this claim. The “Sisters of Noah” as they nicknamed these olive trees are estimated to be between 4000 and 6000 years old. Then, there’s the AL-Badawi tree in Al-Walaja south of Jerusalem – another 4000-year-old olive tree. In contrast, the Monumental Olive Tree of Vouves is about 3000 years old, but an impressive sight. The Monumental Olive Tree of Vouves is an Olea Europea tree of the Mastoeidis variety. Its trunk presents unusual twists and hollowness, which gave it the local characterization “striftolia” (twisted olive tree). The olive-growing methodology based on the annual growth rings (Nikos Mihelakis, 2002) approximates the age of the tree around 3000 years. It is presumed that the tree first appeared in 1100 BC, in the Sub-Minoan period of the Cretan history. 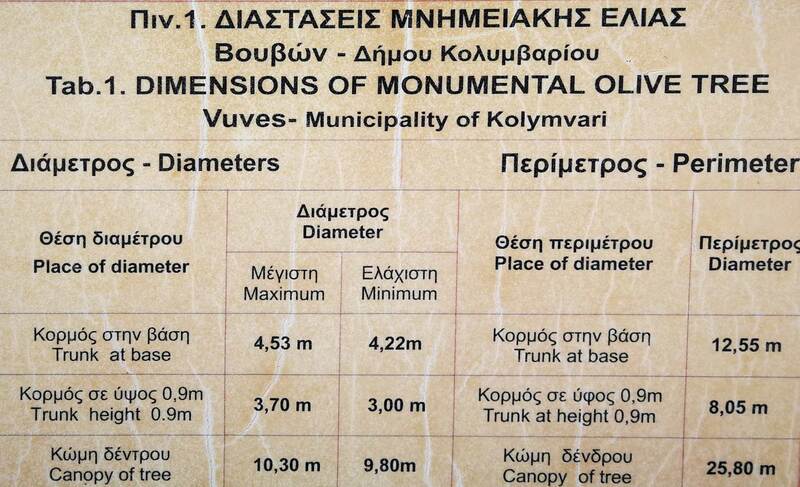 Dimensions of the Monumental Olive Tree of Vouves. The tree was declared a natural monument with the decision no. 603/17-2-1997 of the Secretary-General of the Region of Crete and it attracts more than 20000 visitors to the Vouves village in Kolymvari. 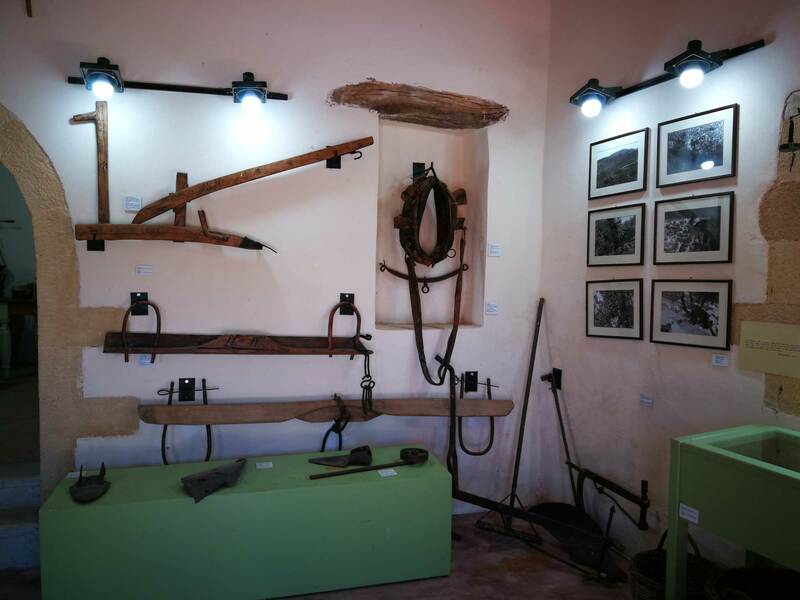 Next to the tree, the Olive Tree Museum of Vouves complements the visit with a wealth of exhibits that demonstrate the cultivation of olive trees in the area and the processing of olives for olive oil and other purposes. The museum is housed inside two buildings that served as the home of the Karapatakis family, at its fourth generation still living in Vouves today. They own the tavern next to the square of the tree, where you can stop for homemade Cretan fare during your visit. 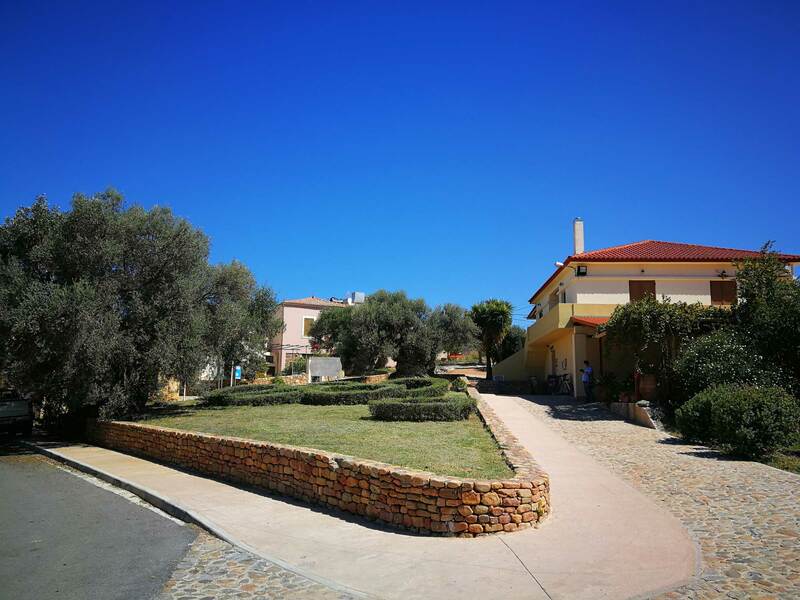 You can gaze at the olive tree at ease here, and even have a cheerful chat with Katerina, the daughter of Panagiotis Karapatakis who donated the buildings to the Municipality to be used as a museum. In fact, the Karapatakis owned the olive tree and the land of the square too. Their decision to donate the tree to the local government came in 1997, right after the tree was declared a natural monument. The Monumental Olive Tree of Vouves in the center of the image, and the tavern at the right. tools used until the middle of the previous century (the mid-1950’s) in an uninterrupted, daily and continuous manner for many centuries or even millenniums by the people of this land and then suddenly disappeared, not only from their lives but also from their memories. Elevated Olive Tree of Vatolakkos, and we will continue to travel around the island to discover more of these natural wonders. What’s astounding about these timeworn sentinels is that they still produce olives. They are all in regions prized for their olive oils – to reach them you will pass endless olive groves too. Don’t miss the opportunity to taste the local artisan olive oils.